References _constructWindowContents(), abiAddButton(), abiDialogNew(), BUTTON_CANCEL, BUTTON_DELETE, BUTTON_INSERT, XAP_App::getStringSet(), XAP_StringSet::getValueUTF8(), m_btInsert, m_combo, XAP_Dialog::m_pApp, m_window, and s.
References __onKeyPressed(), XAP_App::getStringSet(), XAP_StringSet::getValueUTF8(), m_combo, XAP_Dialog::m_pApp, and s.
References AP_Dialog_GetStringCommon::a_DELETE, m_combo, AP_Dialog_GetStringCommon::setAnswer(), AP_Dialog_GetStringCommon::setString(), and tostr(). 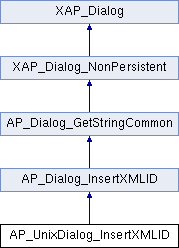 References AP_Dialog_GetStringCommon::a_CANCEL, AP_Dialog_GetStringCommon::a_OK, m_combo, m_window, AP_Dialog_GetStringCommon::setAnswer(), AP_Dialog_GetStringCommon::setString(), tostr(), UT_ASSERT, and xxx_UT_DEBUGMSG. Referenced by _constructWindow(), _constructWindowContents(), event_Delete(), and event_OK().